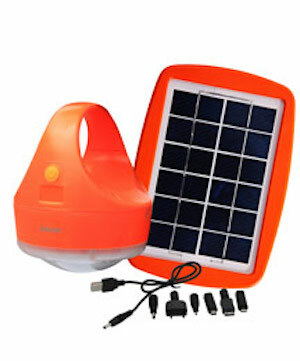 The SSL 200 is a portable solar-powered lamp and mobile phone charger. The lamp can be set to varying brightness levels, and includes a steel stand for use as a desk lamp. The lamp consists of 7 LED bulbs in a single light point. On the "Normal" brightness setting, the battery lasts up to 27 hours on a full battery. On "Turbo" brightness mode, the battery will last up to 4.7 hours. The SL 200 also includes several phone adapters to charge cell phones from the battery.